Book Group entry. OK book...I wish there was a rating for OK. I don't think I'd recommend it. But it was an interesting look at life in communist China. I seem to be on a tear this year of reading books about books. 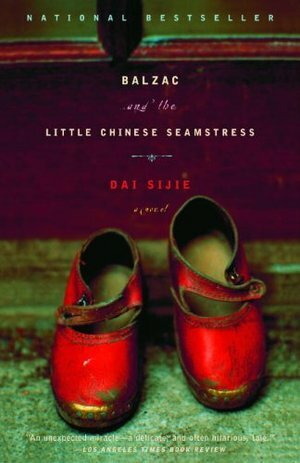 Most I've enjoyed, but few have presented the whole process of reading and learning in quite such a wonderful way as Dai Sijie does in this book. He ably illustrates the pleasures of reading, the way it takes us out of ourselves and improves our lives, by showing us how reading makes the whole process of "reeducation" in Mao's China more tolerable. He shows us how we can become obsessed with books and reading, whether because we are in intolerable situations, or simply because they give us a look into other worlds. The young men in this story risk a great deal for their books without questioning whether its worth it or not. And with the same story he shows us how reading brings people together, and ultimately how it can tear them apart when readers grow in different directions, when they take different lessons and ideas from the same books. It's a deft and surprisingly amusing story about reading, books, young love, ambition, hope, despair, and the power of stories. I enjoyed it tremendously.